A Reddit user posted a photo of a $49.99 BJORKSTA map with the country of New Zealand missing. This isn't the first time an Ikea map left out New Zealand. 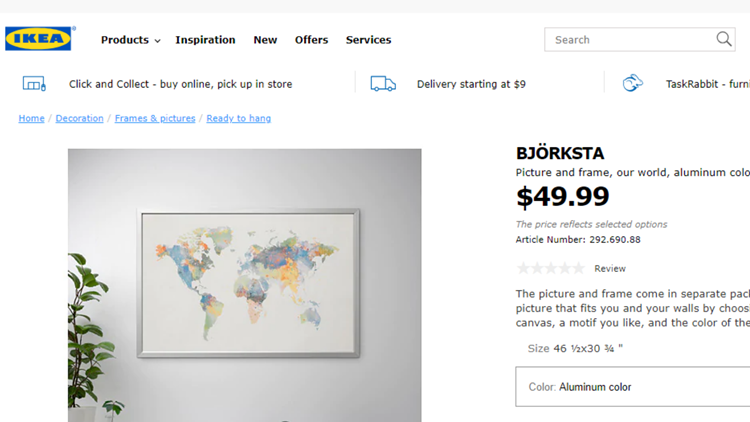 Last week, a Reddit user posted a photo of a BJORKSTA world map without the country of New Zealand being sold in an Ikea in Washington D.C. The post said: "Ikea's map game is not on point." Then on Saturday, the New Zealand Herald reported the Swedish furniture store "has apologized to Kiwis" in a statement to the BBC. "Ikea is responsible for securing correct and compliant motifs on all our products," Ikea said to the BBC. "We can see that the process has failed regarding the product BJÖRKSTA world map - we regret this mistake and apologize." The company said it is working to phase out the inaccurate map from stores. The Herald said this isn't the first time Ikea has advertised an inaccurate world map. The outlet said last year, another Reddit user pointed out an Ikea store had a world map on its wall "missing our great country." Another user, according to the Herald, said on the Reddit post that "Ikea hadn't yet colonized New Zealand, but that's no excuse for them to leave us off the map."